An unmanned Antares rocket exploded six seconds after liftoff from NASA’s Wallops Island launch facility in Virginia at 6:22 p.m. EDT. The cause of the accident wasn’t immediately known, NASA mission commentator Dan Huot told Reuters. NASA said there were no injuries. The rocket, made by Dulles, Virginia-based Orbital Sciences, is a two-stage launch vehicle designed to ferry payloads to the International Space Station. "Maintain your consoles," 'Orbital Sciences' mission control said to the roomful of engineers and technicians, monitoring the launch, AP reported. Data from the launch were being collected for an investigation into the cause of the accident. The rocket was carrying a Cygnus spacecraft packed with 5,055 pounds of supplies, science experiments, and equipment, according to Reuters. The rocket also carried a satellite owned by Planetary Resources, Inc. of Redmond, Wash. The launch was originally scheduled for yesterday but was postponed after a sailboat ventured into the launch site’s hazard zone—an area of about 1,400 square miles off Wallops Island along Virginia’s eastern shore, NASA said. Orbital Sciences is one of two companies hired by NASA to fly cargo to the ISS. The other is SpaceX, of Hawthorne, Calif. 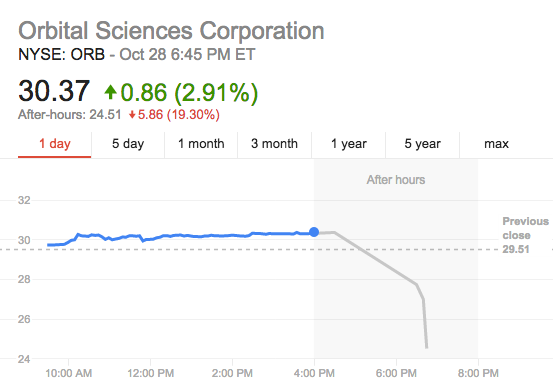 The Orbital Sciences Corporation (ORB) stock fell after the explosion. As of 6:45 p.m. the share price fell 5.86 points (-19.30%) in after hours trading, after closing at 0.86 (2.91%) higher on the day. Before launch @OrbitalSciences team wasn't tracking any issues. No injuries have been reported & all personnel around launch site accounted.
.@OrbitalSciences is currently evaluating the status of its mission. Visit http://t.co/he3w3DDGI3 for the latest information. Orbital Sciences Corporation confirms that today’s Antares rocket launch from NASA’s Wallops Flight Facility was not successful. Shortly after lift-off from the Mid-Atlantic Regional Spaceport Pad 0A at 6:22 p.m. (EDT), the vehicle suffered a catastrophic failure. According to NASA’s emergency operations officials, there were no casualties and property damage was limited to the south end of Wallops Island. Orbital has formed an anomaly investigation board, which will work in close coordination with all appropriate government agencies, to determine the cause of today’s mishap. Orbital will provide more information as it becomes available and is verified. ATLANTIC, Va. (AP) — An unmanned commercial supply rocket bound for the International Space Station exploded moments after liftoff Tuesday evening, with debris falling in flames over the launch site in Virginia. No injuries were reported following the first catastrophic launch in NASA's commercial spaceflight effort. The accident was sure to draw criticism over the space agency's growing reliance on private U.S. companies in this post-shuttle era. NASA is paying billions of dollars to Orbital Sciences and the SpaceX company to make station deliveries, and it's counting on SpaceX and Boeing to start flying U.S. astronauts to the orbiting lab as early as 2017. This was the fourth flight by Orbital Sciences to the orbiting lab. The Orbital Sciences' Antares rocket blew up over the beachside launch complex at Wallops Island. The company said everyone at the site had been accounted for, and the damage appeared to be limited to the facilities. And nothing on the lost flight was urgently needed by the six people living on the 260-mile-high space station, officials said. Flames could be seen shooting into the sky as the sun set. Orbital Sciences' executive vice president Frank Culbertson said things began to go wrong 10 to 12 seconds into the flight and it was all over in 20 seconds when what was left of the rocket came crashing down. He said he believes the range-safety staff sent a destruct signal before it hit the ground. Bill Wrobel, director of NASA's Wallops Flight Facility, said crews were letting the fires burn out late Tuesday and set up a perimeter to contain them in the darkness. This was the second launch attempt for the mission. Monday evening's try was thwarted by a stray sailboat in the rocket's danger zone. The restrictions are in case of just such an accident that occurred Tuesday. Culbertson said the top priority will be repairing the launch pad "as quickly and safely as possible." He said he could not guess how long it will take to determine the cause of the accident and to make repairs. Culbertson said the company carried insurance on the mission, which he valued at more than $200 million, not counting repair costs. He stressed that it was too soon to know whether the Russian-built engines, modified for the Antares and extensively tested, were to blame. "We will understand what happened — hopefully soon — and we'll get things back on track," Culbertson assured his devastated team. "We've all seen this happen in our business before, and we've all seen the teams recover from this, and we will do the same." The Wallops facility is small compared to NASA's major centers like those in Florida, Texas and California, but vaulted into the public spotlight in September 2013 with a NASA moonshot and the first Cygnus launch to the space station. Michelle Murphy, an innkeeper at the Garden and Sea Inn, New Church, Virginia, where launches are visible across a bay about 16 miles away, witnessed the explosion. "It was scary. Everything rattled," she said. "There were two explosions. The first one we were ready for. The second one we weren't. It shook the inn, like an earthquake." Culbertson advised people not to touch any potentially hazardous rocket or spacecraft debris that came down on their property or might wash ashore. Immediately after the explosion, the entire launch team was ordered to maintain all computer data for the ensuing investigation. Culbertson advised his staff not to talk to news reporters and to refrain from speculating among themselves. "Definitely do not talk outside of our family," said Culbertson, a former astronaut who once served on the space station. This newest Cygnus cargo ship — named for the swan constellation — had held 5,000 pounds of space station experiments and equipment. By coincidence, the Russian Space Agency was proceeding with its own supply run on Wednesday, planned well before the U.S. mishap. And SpaceX is scheduled to launch another Dragon supply ship from Cape Canaveral in December; some items may be changed out to replace what was lost on the Cygnus. NASA space station program manager Mike Suffredini told reporters that the station and its crew have plenty of supplies on board — about five months' worth — even without the upcoming launches. Among the science instruments that were lost: a meteor tracker and 32 mini research satellites, along with numerous experiments compiled by schoolchildren. Suffredini promised the experimenters would get a chance to refly their work. The two Americans, three Russians and one German aboard the space station were watching a live video feed from Mission Control and saw the whole thing unfold before their eyes. Until Tuesday, all of the supply missions by the Virginia-based Orbital Sciences and California-based SpaceX had been near-flawless. President Barack Obama has long championed this commercial space effort, well before NASA's space shuttles were retired in 2011. He's urged that NASA focus its human spaceflight effort less on nearby orbit and more on destinations like asteroids and Mars. He was informed of the accident while on a campaign trip in Wisconsin. SpaceX's billionaire founder and chief officer Elon Musk — whose company is the face, in many ways, of the commercial effort — said he was sorry to learn about the failure. "Hope they recover soon," he said in a tweet. Support poured in from elsewhere in the space community late Tuesday night. "Very sorry to see the Antares rocket launch failure," said Chris Hadfield, a former Canadian astronaut who served as space station commander last year. "Spaceflight is hard. Very glad that no one was hurt." John Logdson, former space policy director at George Washington University, said it was unlikely to be a major setback to NASA's commercial space plans. But he noted it could derail Orbital Sciences for a while given the company has just one launch pad and the accident occurred right above it. The explosion hit Orbital Science's stock, which fell more than 15 percent in after-hours trading. Dunn reported from Cape Canaveral, Florida. AP Science Writer Seth Borenstein in Washington and Associated Press writer Alex Sanz in Atlanta contributed to this report.